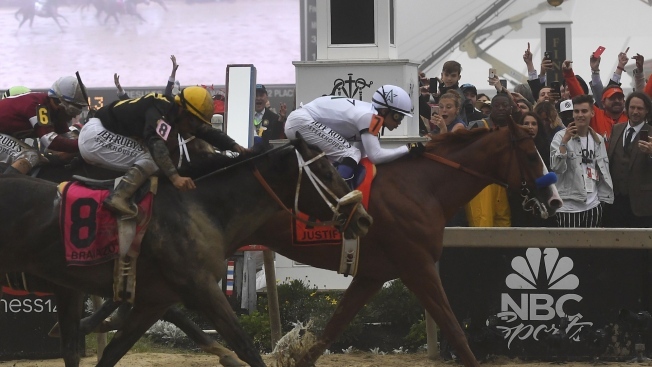 The heavy 2-5 favorite jumped out to the lead, surrendered it briefly to Good Magic and roared back, holding off several hard-charging challengers to win the Preakness through a cloud of fog on a sloppy, slippery track Saturday. Justify has the chance at the Belmont Stakes in New York on June 9 to do the same thing Baffert's American Pharoah did in 2015. "Right now, I don't see why not," Baffert said. Just getting through the Preakness was a test for the Kentucky Derby champion. The start wasn't a problem, but Derby runner-up Good Magic pushed Justify along the back stretch and Bravazo and Tenfold made up ground at the end before the wire. 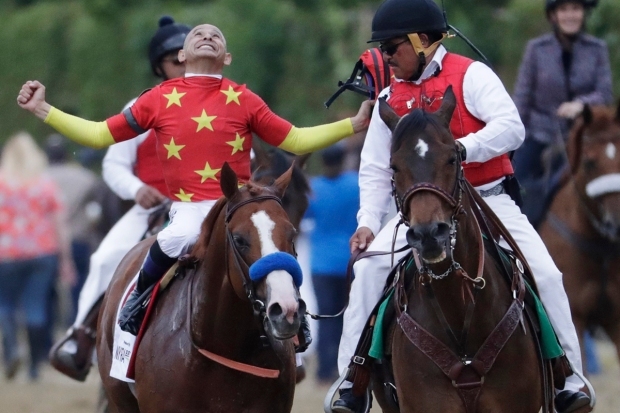 "You could tell he was in a fight the whole way," Baffert said. "He's just a great horse to handle all that pressure and keep on running." As Baffert was praying for the wire at Pimlico, Justify won by a half-length. Bravazo edged Tenfold for third, and Good Magic was fourth, running out of gas at the end of the 1 3/16-mile race. That almost happened to Justify, who won his first four races by a combined 21 1/2 lengths. 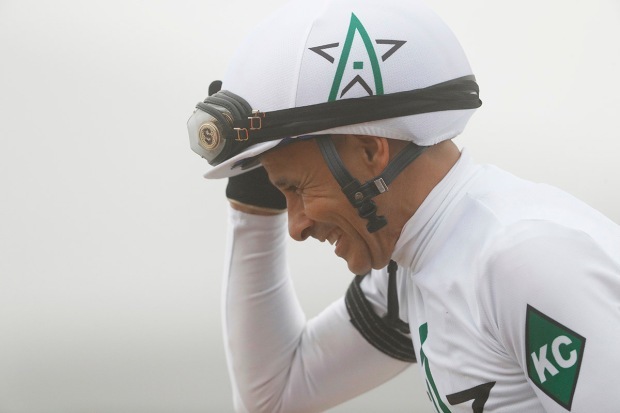 Jockey Mike Smith was worried when he saw Good Magic over his shoulder and when Justify slipped early, and he was hoping there was enough left to get to the wire. "He got a little tired," Smith said. "This is his hardest race that he's had." Baffert tied veteran D. Wayne Lukas' record with his 14th victory in a Triple Crown race and matched 19th-century trainer R.W. Walden with his seventh Preakness title. Baffert also remained undefeated with Derby winners in the Preakness following Silver Charm, Real Quiet, War Emblem and American Pharoah. 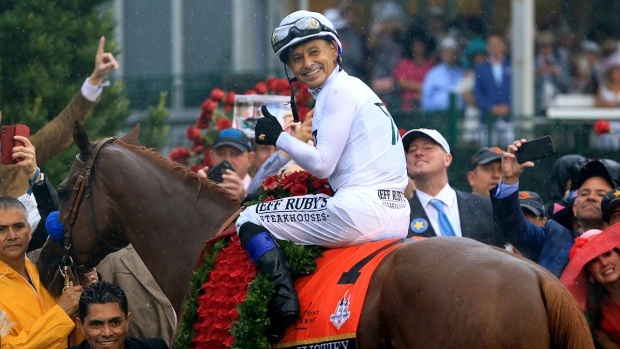 Derby champ Justify has something special – but so does his jockey, 52-year-old Mike Smith. Justify showed more evidence of being the same kind of super horse as American Pharoah, and Baffert has repeatedly drawn comparisons between them. Justify showed no ill effects from a bruised heel on his left hind foot that was discovered in the aftermath of the Derby, an injury Baffert insisted was minor and over within 24 hours. With an eye on the 1 1/2-mile Belmont, Baffert said he and his team would evaluate Justify but more importantly would make sure he's good to run again in three weeks. "We're going to make sure that he comes out of the race well and he trains well for it," Baffert said. "He's going to have to be really training well."